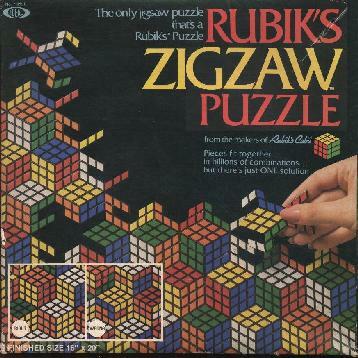 Rubik's Zigzaw Puzzle is a kind of jigsaw puzzle. The picture it is supposed to form consists of a large number of solved Rubik's Cubes. Except for the edge pieces of the puzzle, nearly all pieces have the same frog-like shape so that it is easy to put the pieces together in the wrong way, but then the picture shows cubes that have been mixed. It was made by the Ideal Toy Corporation in 1982. The German edition was called Rubik's Profi Puzzle. There are 81 frog shaped pieces, 8 other interior pieces and 42 edge pieces, for a total of 131 pieces. The box says "Pieces fit together in billions of combinations... but there's just ONE solution". This is a slight underestimate, as even the 81 frog-shaped pieces alone have 81! possible arrangements, which is about 5.8·10120. Of course this is not a realistic measure of difficulty, since you would never continue after a piece is visibly wrongly positioned. The picture below shows the solved arrangement. I have faded out the colours a bit so that the contour lines are more visible.